Interior door handle Hoppe aluminium Marseille series on round rose. Anodized aluminum door handle produced by Hoppe. Particularly curved handle inward. Predisposed to fast assembly with the help of the quick-fit connection release that will save time at installation of the door. 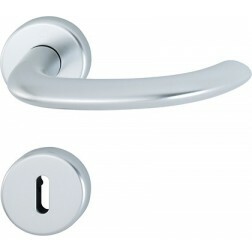 The price displayed is for one pair of handles, rosettes, escutcheons and mounting accessories. Everything packed and boxed.